All living things, from the tree outside your window, to your pet, to your own body are made of many tiny living cells. Each cell is the smallest unit of life and is so small a microscope is needed to see it. Believe it or not, the human body is actually made of about 5 trillion cells. Cells work together to form organs, organs work together to form body systems, and body systems work together to make the entire body tick. For example, brain cells work together to form the brain, the brain and nerves throughout your body work together to form the nervous system, and the nervous system works with all the other organ systems in your body, such as your digestive system. While cells are the smallest living unit of life, when looking at a cell more closely you realize that it is actually subdivided into organelles. Organelles perform all the tasks a cell needs to do, such as using food to make energy and removing wastes. Each type of cell (some examples are muscle cells, brain cells, and blood cells) is specialized to perform the tasks they need to accomplish to keep the cell alive. An analogy is a comparison of two things that are the same in some ways, but not in others. Usually, when comparing two things you may use the word "like". For example, someone may say a light bulb is like the sun. It is an analogy since both a light bulb and the sun give off light, so they have a similar function, but what they look like is very different. The sun is a star while a light bulb clearly is not. This is an example of an analogy where the function of the two things is similar, but not what it looks like. An example of an analogy of two things that look alike but do not do similar things is that of a rope and electrical wire. They generally look very similar, but rope is used to tie things together while electrical wire is used to carry electricity. In a very good analogy, the two things being compared will be similar in BOTH what it is used for and what it looks like. Finally, try to think of some of your own analogies! Remember, some analogies are between things that do similar things, some are between things that look alike, and good analogies have a little bit of both types. Cut out the descriptions of the function of each of the cell organelles and the parts of a city along the dotted lines. Make analogies between the functions of the cell organelles and functions of parts of a city and place the two pieces of paper next to each other. In all of these cases, the cell organelles and a part of the city will have similar functions. After you have matched each part of the city with a cell organelle function, check the key on the last sheet to see if you are right. Glue the associated cell organelle functions and the parts of a city back to back on a Popsicle stick using the glue stick. 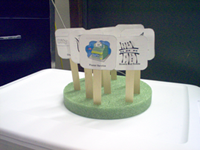 Poke the Popsicle sticks into the Styrofoam to make your city! Add extra decorations or color your Styrofoam to make it look more like a city if you would like. Finally, you can even use your as Popsicle stick flashcards! Try and quiz each other about the cell organelles and their functions. Can you think of any other analogies for each of the organelles, such as objects that look similar to each of the organelles? What you have made here are analogies between organelles in an animal cell and the different parts of a city. Cells in plants are slightly different than cell in animals. Many of the organelles are the same, but plants do have some additional and different organelles. Use the additional sources to find the structure and function of plant cell organelles. How are they the same as animal cells and how are they different? Can you think of other parts of a city that do similar things to the plant cell's organelles? Make these new analogies like you did for the plant cell and make a "plant cell city!" Just like the many parts of a city, the organelles of a cell need to work together for it to function smoothly. When one of the organelles does not function correctly, this can result in a disorder. For example, defective lysosomes that do not get rid of excess chemicals in brain cells cause fatal Tay-Sachs disease. Therefore, it is very important that all the organelles do their jobs in the cell. Right-click on the images to view and save full-sized versions of the graphics below or download the Cell Cards as a PDF.